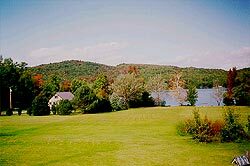 The Farm at Worthley Pond is a remodeled 1850 farm, located on 5 acres, nestled in a beautiful mountain valley surrounded by rolling hills. Located on a sparkling clear lake with a private beach only 125 yards from the Farm that is perfect for all season recreation. Only 40 miles from the Appalachian Trail and the large peaks of the White Mountains, these foot hills offer both beauty and day hiking. It is perfect for vacations, wedding receptions and family reunions. It is also an ideal setting for small group meetings such as staff retreats, board strategic planning, faculty curriculum planning, grant writing and sales group planning. Located just three hours north of Boston's Logan Airport near Bethel, Maine, the year-round facility offers a secluded mountain setting. The Farm can accommodate wedding parties as large as 200 in-doors and 500 out-doors. Winter offers bountiful recreational opportunities for guests staying at The Farm at Worthley Pond. Three world class ski areas are within 1.5 hour drive, including Sunday River in Bethel, Maine only 45 minutes away. Smaller ski areas of Black Mountain and Mt. Abram are less than 30 minutes away. Cross country ski and snowmobile enthusiasts can enjoy the many trails, which honeycomb the foothills, outside the Farm's front door. A special treat for cross country skiers is Black Mountain, located just 20 minutes away, where the U.S. Cross Country Ski Team trains. Worthley Pond is located in Peru, Maine. It is 3 hours from Logan Airport in Boston. The largest local town is Rumford, Maine located 15 miles north. It is also the closest large food store. Worthley Pond is located in the western mountains of Maine approximately 30 miles from the New Hampshire border. Directions: FROM BOSTON, I-95 north to Maine Turnpike to I-495 to exit #75 Auburn, Maine. Left turn onto route #4 north (through Auburn) to Livermore. Left turn onto route #108 north towards Rumford. Left turn onto road with sign "TO ROUTE 219" (approximately 6 miles after Canton, Maine). This road only turns left as you are headed towards Rumford. It also has a sign to "Worthley Pond." Drive about 1.5 miles to first fork. Take left fork (East Shore Road), for about 1 mile, to large white farmhouse with barn attached on right side (Pond Side) of road. The Farm has a green sign advertising group rentals on barn. The physical address is 153 East Shore Road. The local phone number is 207-562-4653 (limited cell phone service).